5 Steps to Happier, Less-Stressed Clients: Part 1 | Vickery and Co.
Everyone likes to know the ground rules – – what is expected of them, what can they expect from others. When we, as humans, are not armed with knowledge we feel like our lives are spinning out of control. When someone feels out of control, their natural instinct is to grip tighter, to be louder, to push harder. You see where this is going, right? When we follow those instincts, we push people even further away and things get even more stressful. This is one of the reasons professional experts are so helpful. As a professional, you are in the unique position to help ease stress and tension for clients. Your ability to step up and into a role that eases the burden of a client and the comfort they have in knowing you are part of their tribe can be a complete game changer. Below are the first two of five steps that, when implemented, ease client stress and tension, instill confidence in you (the professional) and make clients’ lives easier, happier and a lot more enjoyable. Know what you are talking about: I recognize this should go without saying, but know what you are talking about! If you are going to sell yourself as the expert — you better actually be an expert. Make sure you are up to par on industry standards and knowledge. Don’t ever make the mistake of thinking you have learned it all and learning stops there. Being good at your job means always setting time aside to stay on top of the Industry. Ways to remain knowledgeable are joining event specific networking groups, going to industry educational events and conferences. Also, check out webinars and join mastermind groups. Put yourself out there, talk to people and know that they have information to share with you that will make you better at your job. This leads to more clients, more income and a solid reputation in your industry. Set and maintain clear boundaries: Boundaries are limits that define acceptable behavior. As it relates to business, boundaries can be set with co-workers, clients and yourself. By putting boundaries in place, you confirm your place of power in any situation, instill confidence and retain control of your schedule and interactions with others. 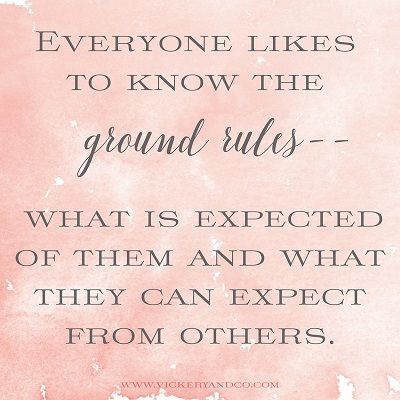 Boundaries enable you to manage expectations which makes for smoother relationships, even with yourself! Now, I often work nights and weekends but I never respond to clients on off hours. I use an email delay system like Boomerang to set my emails up to send when business hours resume. This system allows me to manage my time and still stay within my boundaries as far as my clients can see. Check back next week to learn the last three steps to build stronger relationships with your clients.